St Ives is a market town and civil parish in Cambridgeshire, England, 5 miles (8 km) east of Huntingdon and 12 miles (19 km) north-west of Cambridge. Historically in Huntingdonshire, St Ives is in the non-metropolitan district of the same name which covers a similar area to the historic county. Previously called Slepe, its name was changed to St Ives after the body, claimed to be that of a Persian bishop, of Saint Ivo (not to be confused with Ivo of Kermartin), was found buried in the town in about 1001/2. St Ivo's Priory was built on the site where the body of Saint Ivo was discovered. St Ives was listed as Slepe in the Hundred of Hurstingstone in Huntingdonshire in the Domesday Book. In 1086 there was one manor and 64 households, 29. 5 ploughlands, 60 acres (24 hectares) of meadows and 1,892 acres (766 hectares) of woodland. For the past 1,000 years St Ives it has been home to some of the biggest markets in the country, and in the thirteenth century it was an important entrepôt, and remains an important market in East Anglia. Built on the banks of the wide River Great Ouse between Huntingdon and Ely, St Ives has a famous chapel on its bridge. In the Anglo-Saxon era, St Ives's position on the river Great Ouse was strategic, as it controlled the last natural crossing point or ford on the river, 80 kilometres (50 mi) from the sea. The flint reef in the bed of the river at this point gave rise to a ford, which then provided the foundations for the celebrated bridge. During the 18th and 19th centuries, St Ives was a hub of trade and navigation, and the town had dozens of inns and many bawdy houses. Goods were brought into the town on barges, and livestock rested on the last fattening grounds before delivery to London's Smithfield Market. As the railway network expanded and roads improved, the use of the River Great Ouse declined. It is now mostly used for leisure boats and recreation. The river Great Ouse at St Ives flooded in 1947, and some parts suffered seriously again at Easter 1998 and in January 2003. Extensive flood protection works were carried out on both sides of the river in 2006/2007 at a cost of nearly £9 million. 500 metres (1,600 ft) of brick-clad steel-piling was put into place to protect the town, most noticeably at the Waits where a pleasing plaza has also been created. A further 750 metres (2,460 ft) on the other side of the river protects Hemingford Grey, reducing the yearly risk of flooding from 10% to 1%. Building on the flood plain at St Ives is now discouraged. Original historical documents relating to St Ives, including the original parish church registers, local government records, maps and photographs, are held by Cambridgeshire Archives and Local Studies at the County Record Office in Huntingdon. As a civil parish, St Ives has a town council consisting of seventeen councillors including a major and a deputy-mayor. The second tier of local government is Huntingdonshire District Council, a non-metropolitan district of Cambridgeshire. St Ives has three district wards for the district counci; St Ives East, St Ives South, and St Ives West. St Ives East and St Ives South are both represented by two district councillors, and St Ives West is represented on the district council by one councillor. For St Ives the highest tier of local government is Cambridgeshire County Council. St Ives is part of the electoral division of St Ives  and is represented on the county council by two councillors. St Ives was in the historic and administrative county of Huntingdonshire until 1965. From 1965, the village was part of the new administrative county of Huntingdon and Peterborough. In 1974, following the Local Government Act 1972, St Ives became a part of the county of Cambridgeshire. At Westminster St Ives is in the parliamentary constituency of Huntingdon, and since 2001 has represented in the House of Commons by Jonathan Djanogly (Conservative). For the European Parliament St Ives is part of the East of England constituency. St Ives experienced town planning at a very early date,[when?] giving it a spacious Town Centre. Portions of this open space between Merryland and Crown Street were lost to market stalls that turned into permanent buildings. Some of the shops in the town centre are still to the same layout as in Medieval times, one rod in width, the standard length for floor and roof joists. The lanes along the north side of town are believed to follow the layout of the narrow medieval fields, and are slightly S-shaped because of the way ploughs turned at each end. Similar field boundaries can be seen in Warners Park. In the period 1801 to 1901 the population of St Ives was recorded every ten years by the UK census. During this time the population was in the range of 2,099 (the lowest was in 1801) and 3,572 (the highest was in 1851). In 2011, the parish covered an area of 2,688 acres (1,088 hectares) and the population density of St Ives in 2011 was 3901 persons per square mile (1505.9 per square kilometre). The Monday market takes over the town centre, and is larger in scale on Bank Holidays in May and August. There is a Friday market, and a Farmers' Market on the first and third Saturday every month. The Michaelmas Fair takes over for three days from the second Monday in October, and there is a carnival which is the biggest public gathering in Huntingdonshire. The town has a mixture of shops, bars, coffee lounges, a department store and other amenities. As an important market town, St Ives always needed large numbers of public houses, many of which were bawdy houses: 64 in 1838 (1 for every 55 inhabitants), 60 in 1861, 48 in 1865 and 45 in 1899, although only five of these made the owners a living. As livestock sales diminished, however, so did the need for large numbers of pubs, falling to a low point of 16 in 1962. In that year the Seven Wives on Ramsey Road was opened and, with some openings and closings since, there are 17 today. The pub which has stood on the same site, with the same name, for longest, is the Dolphin, which is over 400 years old. Next oldest is the White Hart, which is pre-1720. Nelson's Head and Golden Lion are at least as old but have not kept the same name and used to be called the Three Tuns and the Red Lion respectively. The existence of a pub on the site of the Robin Hood is also of a similar date, except that it was originally two separate pubs — the Angel and the Swan. The claim of the Royal Oak to date from 1502 cannot be proven since, while a portion at the back is 17th-century (making it physically the oldest portion of any pub in St Ives), the pub name is more recent. The reference is to Charles II's famous escape from Cromwell's Roundheads, and Charles was restored to the throne in 1660. The Golden Lion was a 19th-century coaching inn. The Official Guide to the Great Eastern Railway referred to it in 1893 as one of two "leading hotels" in St Ives and there are a number of ghost stories associated with the pub. St Ives Bridge is most unusual in incorporating a chapel, the most striking of only four examples in England. Also unusual are its two southern arches which are a different shape from the rest of the bridge, being rounded instead of slightly gothic. After the dissolution of the monasteries in 1537, the chapel was given to the prior to live in. The lords of the manor of St Ives changed hands several times, as did the chapel. During this period, it was in turn - a private house, a doctors surgery and a pub, called Little Hell. The pub had a reputation for rowdy behaviour, and it is believed the landlord kept pigs in the basement. The additional two storeys added in the seventeenth century were removed in 1930, due to damage being caused to the foundations. The chapel features colourfully in the historical novel 'Not Just a Whore', by local St Ives resident K M Warwick, where it is described as a fictitious "Bawdy House" (brothel). The bridge was partially rebuilt after Oliver Cromwell knocked down two arches during the English Civil War to prevent King Charles I's troops approaching London from the Royalist base in Lincolnshire. During the war and for some period afterwards, the gap was covered by a drawbridge. The town square contains a statue of Oliver Cromwell erected in 1901. It is one of four statues of Cromwell on public display in Britain, the others being in Parliament Square, outside Wythenshawe Hall and in Warrington. St Ives Corn Exchange is the home of St Ives Youth Theatre (SIYT). The eastern or town end of Holt Island is nature reserve, and the western end, opposite the parish church, is a facility for the Sea Scouts. The scout portion contains what was, before the opening of the Leisure Centre, the town's outdoor town swimming pool. The pool was dug in 1913 and closed to the public in 1949. It is now used by the scouts for canoeing and rappelling. In November 1995, the island was the locus of a significant lawsuit and a break-away Scouting Association was prevented from using and developing a claim to it. The Norris Museum holds a great deal of local history, including a number of books written by its former curator, Bob Burn-Murdoch. After over 30 years of service, Bob Burn-Murdoch retired in December 2012. The Norris Museum was founded by Herbert Norris, who left his lifetime's collection of Huntingdonshire relics to the people of St Ives when he died in 1931.It has recently been reopened in August 2017, following a £1.5m refurbishment and expansion made possible by a Heritage Lottery Fund grant. Its current director is Sarah Russell, and it is managed by the Norris Management Trust, made up of members of St Ives Town Council and the Friends of the Norris Museum. There are 2 leisure facilities, the indoor centre is adjacent to the Burgess conference and Events Hall and an outdoor centre in the west of the town.The original swimming pool, fed by the river, is in the middle of Holt Island and is now used for canoeing practice and other activities. St Ives also has a Rugby club on Somersham Road, and a Non-League football club, St Ives Town F.C., which plays at Westwood Road. The St Ives Rowing Club was once captained by John Goldie and has had a number of members who have competed at Olympic and Commonwealth championships. Each year the town hosts a free 2 day carnival and music festival which was launched in 1999, as part of the committee set up for the millennium. This is now part of the towns tradition and it grows year on year. St Ives has a main secondary school, St Ivo School. Eastfield nursery and infant school, Westfield Junior school and two primary schools Thorndown and Wheatfields. In 2018, a plan was announced to combine and expand Eastfield and Westfield in to one larger community primary school. The major section of the world's longest guided busway, using all new construction techniques and technology, connects St Ives directly to Cambridge Science Park on the outskirts of Cambridge along the route of a disused railway line. The same buses continue into the centre of Cambridge along regular roads in one direction and continue to Huntingdon in the other direction. A shorter section of the same busway system operates from the railway station on the far side of Cambridge to Addenbrooke's Hospital and Trumpington. The scheme, budgeted at £116.2 million, opened in summer 2011. Construction of the busway was beset with problems, causing delays; for example, cracks appeared in the structure allowing weeds to grow through. Contractors BAM Nuttall were fined a significant amount of money for each day that the busway completion date was not met. The St Ives Park & Ride on Meadow Lane is part of the scheme and will open at the same time. A "Green Update" newsletter came out in Winter 2007 with news on conservation work including protection of the Great Crested Newt. St Ives is just off the A14 road on a particularly congested section of the route from the UK's second city, Birmingham, to the port of Felixstowe and thence to the mainland of Europe This 32-kilometre (20 mi) section of road also links the northern end of the M11 (Cambridge and region) to the M1 and the whole of the North of England and Scotland. A new by-pass is planned for St Ives and Huntingdon, leaving the existing alignment near Swavesey and passing to the south of both market towns. A northern bypass has been under discussion for even longer but is not anticipated any time soon. Bus services are provided by Stagecoach in Huntingdonshire and Go Whippet, the former also having its depot near the town. Services to Cambridge and Huntingdon are frequent during the day, though less frequent in the evenings. There are also buses to Somersham, Ramsey and Cambourne. Between 1847 and 1970 the town was served by St Ives railway station on the Cambridge and Huntingdon railway. The line from Cambridge and the station almost survived the 1963 to 1973 Beeching Axe, but were lost to passenger service in the final stages of the process. Some sections continued to be used for freight until 1993. A campaign to reopen the passenger rail service only ended with the ripping-up of disused track shortly before construction of the Guided Busway. 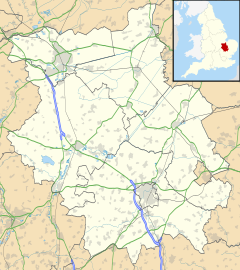 Huntingdon, 7 miles (11 km)) away, has the nearest railway station. Buses using the Busway system provide direct links to both Huntingdon and Cambridge stations. All Saints parish church, May 2014. The Free Church and Market Hill. There are ten places of worship, including the ancient parish church. Many other Christian denominations are also represented, and the town also has a mosque and an Islamic Community Centre. All Saints Church (Church of England) on Church Street has been in the town since AD970 and is one of only two Grade I listed buildings in the town, the other being The Bridge. Originally the parish church of the settlement of Slepe, before St Ives came into existence, it now enjoys a tranquil location at the end of Church Street, situated to the west of the town centre. All Saints, as it stands today, dates largely from the rebuilding of the late 15th century. It was extensively reordered in the late 19th century by Sir Ninian Comper. The church which dominates the town's market place, is The Free Church (United Reformed Church). This was built in 1864, but was modernised in 1980, moving the worship area upstairs. The Church of the Sacred Heart (Roman Catholic) on Needingworth Road, was originally built by Augustus Pugin in Cambridge, but was dismantled in 1902 and transported by barge to St Ives. The hall at the back was added in about 2001. The current Methodist Church on The Waits opened in 1905. Crossways Church (Assembly of God) meet at Crossways Christian Centre on Ramsey Road. St Ives Christian Fellowship (Partnership) meet at Thorndown Junior School on Hill Rise. The Bridge Church (New Frontiers) meet in a newly renovated former industrial building on the corner of Burrel Road and Marley Road. St Ives Evangelical Christian Church (Evangelical) meet at the Burleigh Hill Community Centre, off Constable Road. The town name is featured in the anonymous nursery rhyme/riddle "As I was going to St Ives". While sometimes claimed to be St Ives, Cornwall, the man with seven wives, each with seven sacks containing seven cats etc. may have been on his way to (or coming from) the Great Fair at St Ives. On Ramsey Road there is a public house called The Seven Wives, though this is a modern pub with no connection to the ancient rhyme other than the name. The term tawdry is a St Ives derived word (vying with the rival Ely claim), basically meaning something that is 'cheap and cheerful', and was evolved directly from the St Audrey's Lane cloth market held during the mediaeval and later ages. Made from discarded inferior wool and/or other felt fibres, it was a popular source of cheap material bought by the locals, and those further afield, who flocked to the market in their droves to buy cheap supplies for their own domestic clothing. ^ Professor J.J.N. Palmer, University of Hull. "Open Domesday: Place - St Ives". www. opendomesday.org. Anna Powell-Smith. Retrieved 25 February 2016. ^ "1998 Floods in St Ives". Archived from the original on 21 July 2011. Retrieved 6 September 2009. ^ "2003 Floods in St Ives". Retrieved 6 September 2009. ^ "£8. 8m flood defence scheme opened". BBC News. 22 June 2007. Retrieved 6 September 2009. ^ "St Ives Town Council: Councillors". www.stivestowncouncil.gov.uk. St Ives Town Council. Archived from the original on 11 March 2016. Retrieved 8 February 2016. ^ "Cambridgeshire County Council: Councillors". www.cambridgeshire.gov.uk. Cambridgeshire County Council. Retrieved 15 February 2016. ^ a b Stuart Fisher (2013). British River Navigations: Inland Cuts, Fens, Dikes, Channels and Non-tidal Rivers. A&C Black. p. 151. Retrieved 29 July 2014. ^ Great Eastern Railway (1893). The Official Guide to the Great Eastern Railway. Cassell. p. 271. Retrieved 29 July 2014. ^ Damien O'Dell (2013). Paranormal Cambridgeshire. Amberley Publishing Limited. p. 53. Retrieved 29 July 2014. ^ Alan Wood (2013). Military Ghosts. Amberley Publishing Limited. p. 69. Retrieved 29 July 2014. ^ Dennis William Hauck (2000). The International Directory of Haunted Places. Penguin Group. p. 18. Retrieved 29 July 2014. ^ "SCOUTS FIGHT FOR RIGHT TO ISLAND". Local Government Chronicle. Emap Communications. 19 November 1995. Retrieved 6 November 2008. ^ "Norris Museum". Norris Museum. Retrieved 2012-06-11. ^ "St Ives museum comes to an end of an era". Hunts Post. 9 August 2012. Retrieved 17 March 2013. ^ Kirby, Andy. "St Ives Rugby Union Football Club". Stivesrufc.co.uk. Retrieved 2012-06-11. ^ "Secretary Of State Celebrates Start Of Works On Guided Busway". Cambridgeshire County Council. 5 March 2007. Archived from the original on 6 June 2009. Retrieved 6 September 2009. ^ "The Busway Network". Cambridgeshire County Council. Archived from the original on 16 April 2009. Retrieved 6 September 2009. ^ "Cambridgeshire Guided Busway - Information about the scheme" (PDF). Cambridgeshire County Council. 10 January 2007. Archived from the original (PDF) on 28 May 2008. Retrieved 6 September 2009. ^ "Guided Busway Update" (PDF). Cambridgeshire County Council. October 2008. Archived from the original (PDF) on 9 June 2011. Retrieved 6 September 2009. ^ "Guided Busway Green Update - Winter 2007" (PDF). cambridgeshire County Council. 26 November 2007. Archived from the original (PDF) on 9 June 2011. Retrieved 6 September 2009. ^ "Ellington to Fen Ditton Improvemebt" (PDF). Highways Agency. November 2008. Archived from the original (PDF) on 5 June 2011. Retrieved 6 September 2009. ^ Catford, Nick. "Station Name:ST. IVES (Huntingdonshire)". www.subbrit.org.uk. Retrieved 29 October 2008. ^ Indeed in the earliest recorded English version of the riddle, of 1730, there were nine wives. See main article. ^ Brooke, Rupert (May 1912). The Old Vicarage, Grantchester. Café des Westerns, Berlin. Archived from the original on 2 March 2009. Retrieved 21 March 2009.